I certainly enjoyed eating the Korean short rib tacos during the week but by the end of the week I is looking to change things up a bit. Another item on the Kogi menu was burritos and those burritos are breakfast burritos with eggs. Thought the breakfast burritos sounded good I was thinking of a more dinner style burrito. I normally construct my burritos with a base of rice, beans and meat and then add the extras like salsa, cheese, etc. For the barbecue short rib burritos I went with cilantro and lime rice made with brown short grain rice, the Korean style refried beans , the barbecue short ribs and the other fixings from the short rib tacos. The Korean short rib burritos were pretty easy to make given that most of the ingredients were already made and they turned out nicely. The cilantro and lime rice and refried beans went really well with the Korean short ribs and the rest of the taco condiments. The burritos were nice and tasty and filling with the perfect amount of heat. 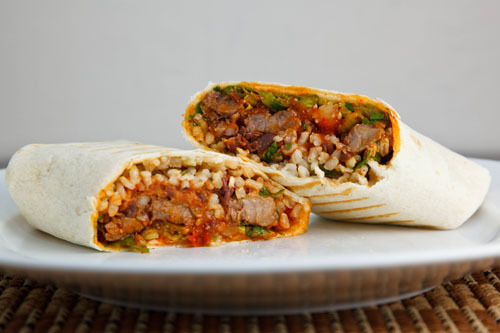 The next time I make kalbi I am going to have to try the breakfast version of these burritos as well. You are making me think that we should take all sorts of ethnic foods and then make tacos and burritos out of them. How fun would it be to come up with side dishes to stuff in the tacos and burritos as well as different variations on rice and refried beans? Love the burritos. What a great creation! Those burritos are definitely scrumptious looking! Really awesome. I am enjoying your Korean and Mexican fusion. The recipe works. is there still more? you certainly made good use of this Korean fusion. Great, looks so delicious! I really would love to try these! wow…this is now my all time favorite webpage! hell of a lot better than foodnetwork! thanks for the great recipes! FYI: Check out http://www.maangchi.com. Great authentic korean video classes. Nice. Ironically I took home some short ribs yesterday from a party I went to, So I may just be making myself some burritos or tacos soon. Woohoo!! I'm a big fan of the Kogi truck, and I love that you're recreating the menu! And by making it at home, you're skipping the hour-long line that the Kogi truck sometimes has!! O, those burritos look just packed full of flavor!!! Primo stuff, Kevin. That picture looks straight out of a great cook book. As always, it looks delicious! What a nice twist on a burrito. There's not much Korean food in my part of the world, and I can't even say that I've ever had authentic Korean food. But looking through the ingredients, it looks very good, almost familiar, thanks to your fusion. I love that you do your burrito in the panini press – what a great idea! Wow, Kevin, you're really getting into this whole Korean Mexican fusion thing! Good for you! I'm a big fan of anything burrito, and these would be no exception! These look really good. I'm going to be craving them all day! Looks delicious – best thing for me is that there is no cheese! Is there a Kogi truck in Canada too? mmmm I love it! Thats a nice combo of different cuisines. Looks really good! Kevin, just brilliant! Way to get creative, while still respecting the cuisine of my people. I love it!